Audioengine A5+ is an update on the Audioengine A5, excellent active speakers, now including a remote control and boasting a powerful 45W per channel with integral subwoofer ports for excellent bass - a quality upgrade for your iPod, laptop, Mac, computer and more - in black, white or bamboo. Designed for optimal ease of setup and versatility, the Audioengine A5+ has a built-in power port for iPod charging while listening to your music, watching movies, or playing games. Plug an iPod Dock or iPod directly into the Audioengine Combo Port and you're ready to rock (or roll). The Combo Port USB charger is compatible with the nano and video iPod as well as all other products that charge via USB. What can I plug into the A5+? As well as being compatible with iPod nano and and video, you can connect the Audioengine A5+ to other mp3/portable music players, external docks, LCD/Plasma screens, game consoles, DVD/Blu ray players, satellite receivers, CD players, PDAs and mobile phones, PCs and laptops and practically anything else which features an audio output! What goes into each A5+? Audioengine designs and manufactures their our own drivers, woofers, crossovers, amplifiers, power supplies, and cabinets. This means that all of these parts are painstakingly tuned together to offer the best possible sound quality. This is a unique feature of this system which isn't the case for most small active speaker systems, where the manufacturer buys in "standard " parts and just puts them together. Furthermore, the speakers are designed to offer performance as close as possible to studio monitors, speakers which offer a theoretical flat frequency response, and offer a sound as close as possible to the original recording. The Audioengine A5+ features audiophile quality, ferro-fluid cooled, 20mm silk dome tweeters with Neodymium magnets and 5" Kevlar woofers, which is very strong, meaning the woofer retains its shape when being driven at high levels. Even the cabinets are designed with the same care and attention with 1” thick high-resin MDF walls and extensive internal bracing. All edges are rounded which look great and also reduce high-frequency diffraction effects on the front baffles. Each cabinet contains tuned, rear-firing ports. 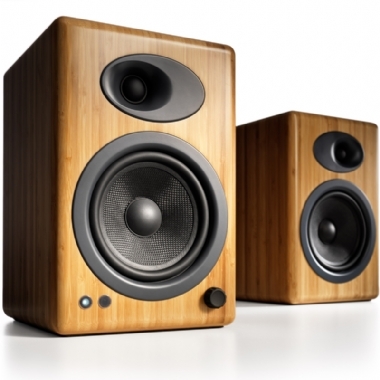 Both speakers are tuned together and sold in pairs. Both cabinets are shielded to allow placement close to a screen without causing interference. With an AC power jack in the rear panel, the Audioengine 5 provides the ability to stream music from your laptop directly to the speakers through Apple's Airport Express. The rear panel AC outlet is also ideal for providing power to other portable and home A/V equipment. A 2nd auxiliary mini-jack is located nearby for audio input from the Airport Express or other products. Plenty of cables are included to connect all your gear.